The Gateway to the Middle East is more than just a city of sparkling skyscrapers. The international airport is only five kilometres from the city centre. Taxis are affordable for groups, costing around $35 plus an airport charge of $7. The official cabs are cream coloured; those with a pink trim have female drivers. The metro runs every 10 minutes from Terminals 1 and 3 (operating times depend on the day but are usually 5:50am to midnight; there is no service on Friday mornings). The cost is 70c to $3 for a standard ticket. Buses run from Terminals 1, 2 and 3 but you’ll need a NOL Card (a pre-paid card that allows you to travel on Dubai’s metro, buses, water buses and tram) as cash is not accepted onboard. The metro covers the length of the city along Sheik Zayed Road, from the airport to Jebel Ali. Taxis are usually waiting out the front of hotels and malls; they’re also easy to flag down. There’s a minimum charge of $3.50. You can hire a car with a driver for around $150 (for five hours) to take you wherever you want to go (in air-conditioned bliss!). Ask your hotel for information. If you’re in the Dubai Creek area, you can cross over to the other side on an abra (a traditional water taxi). It costs less than $1 for a ride; the areas surrounding are great to explore on foot with alleyways and souqs. There are four abra stations on the creek and it operates from 5am til midnight. Do you speak English? Btíhki inglízi? Where is the bathroom? Ayna Al Hamam? How much does it cost? Kam et-taklefa? Located on the creek, Al Bastakiya is an area of authentic Arab mud brick houses that was once home to rich citizens. Surviving plans for demolition in the ’80s, the area is now a great place to pick up arts and crafts (multi-patterned woodwork, pottery, metal work). The fort is also worth looking at, built in 1787, it now houses a museum of the history of Dubai. There’s more to do out here than camel safaris and Arabian sunsets – as incredible as they are – like a spot of falconry, perhaps? Dating back to the 7th century BC, this is one of the UAE’s oldest traditions and an important part to the country’s cultural heritage, originally used for hunting but now purely for sport. Learn about the history of this sport, the skills required to be a successful falconer and have a go yourself. Situated between the world’s tallest building and a sprawling five-star hotel is a UNESCO-protected wildlife sanctuary and utopia for twitchers. The Ras Al Khor Wildlife Sanctuary is a 620-hectare site, home to 20,000 birds during the winter months, including the magnificent flamingo. You can’t go inside, but you can bird-watch from the designated shelters on the edges. Dubai is a shoppers’ heaven (or hell, depending on how you look at it) with an endless list of places to splash your cash. We simply can’t ignore these blissfully air-conditioned behemoths that roll shopping malls, ski fields, ice-skating rinks, hotels, art galleries, IMAX theatres, theme parks, aquariums and mosques all into one loooong shopping experience. With brands from Oscar de la Renta to Top Shop, they’ve got everyone covered. There are so many to choose from including the Spice Souq in Deira (spices, incense, rugs, and decorative oil lamps and homewares), the Gold Souq in Deira (affordable yellow gold), the Perfume Souq on Sikkat al Khail Street (for Arabic scents sold in gorgeous ornamental bottles) and the Textile Souq in Bur Dubai (for all sorts of beautiful fabrics). Set up at different locations on certain days, the Dubai Flea Markets offer shoppers everything from unique artwork to vintage furniture to pre-loved books to Arabic ceramics. For one-of-a-kind pieces, check out these boutiques: Sophie’s Closet sells pretty designer jewellery (Single Business Tower, Sheik Zayed Rd), O’De Rose stocks Aladdin’s-cave-meets-New-York-loft-style homewares (999 Al Wasl Rd), find restored vintage homewares and furniture at The Odd Piece (Al Hadiqa Street, Al Wasl Square) and shop for pre-loved luxury fashion at Garderobe Vintage (Jumeirah Rd, Umm Suqeim). The Arabian Teahouse inhabits a courtyard in an old wind tower building in Bur Dubai (Bastakiya). Sip exotic teas (Angel Dream Tea, Magic Apple, Rooibos Citrus and Ginger, Maté Wizard Flame) under shady trees and feast on the all-day breakfast, fresh salads, sandwiches and desserts. Traiteur at Park Hyatt serves up a seriously chic Friday Brunch (a culinary institution in Dubai, as their working week runs from Sunday to Thursday). You’ll feast on freshly shucked oysters, barbecued lobster, pork charcuterie, roasted lamb plus sweets like crème brulee, crêpes and waffles to soothing jazz sounds. Other top Friday brunches in the city include Saffron at Atlantis, Al Qasr at Madinat Jumeirah, Nobu, Atlantis at the Palm, Toro Toro and Grosvenor House. Omnia Gourmet is owned by British celebrity chef Silvena Rowe. 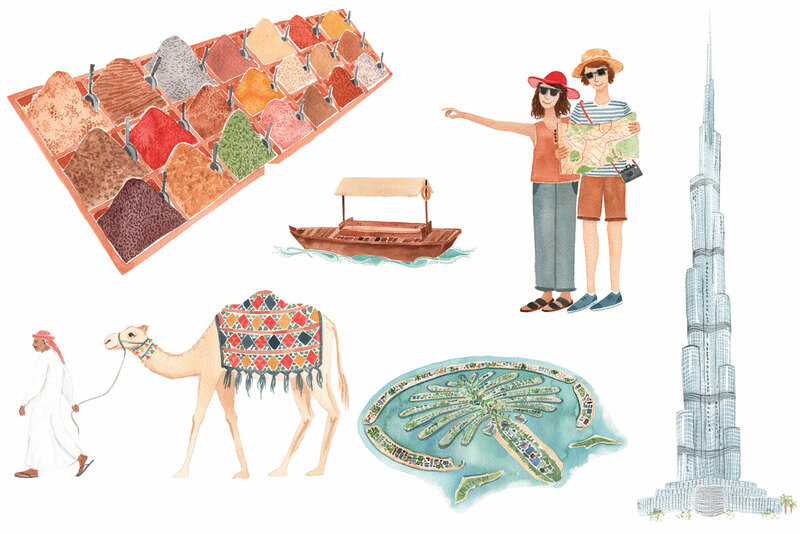 Located in Jumeirah Fishing Village, it’s like an exotic secret garden filled with wicker furniture, colourful inlaid tiles, leafy greenery and delicious and healthy food (gluten-free, raw, sugar-free, dairy-free, paleo and vegan too). Al Fanar caters to authentic Emirati cuisine in a nostalgic setting of 1960s Dubai. Despite the theme park-style set-up (scenes of fake camels, goats and local people), it’s popular with the locals and has a lovely canal setting. A laidback boutique hotel in the Al Fahidi district (the oldest in Dubai) with 13 unique rooms, shaded courtyards, an acclaimed art gallery and café. Within walking distance to the gold and spice souks, the Dubai Museum and the Al Fahidi Historic Area, the Hyatt Regency has 421 rooms, 11 dining options (including a revolving restaurant), a pool, spa, tennis court, ice-skating and golf park. Shoppers – this hotel is dangerously close to Dubai Mall! It has contemporary rooms, four restaurants including Toko (the Dubai outpost of the famous Sydney restaurant) and a small pool with luxurious cabanas. Located on the city’s famous seaside promenade, Jumeirah Beach Residence (or JBR), all rooms and suites have sea views, as does the swimming pool. There’s a spa, six restaurants and the public beach is just a short walk away. With views of the Arabian Sea, the beach and the iconic Palm Island, Atlantis The Palm is like a world in itself. There are 23 restaurants, bars and lounges, a spa, shopping, pools, tennis courts, a kid’s club, and the Aquaventure Waterpark, aquarium and Dolphin Bay. Live out your Arabian nights fantasies at this striking resort just 50 minutes from the city in the Dubai Desert Conservation Reserve. Located amongst rolling dunes are 42 opulent suites, a spa, two restaurants, with a choice of wildlife drives, desert safaris, camel trekking, archery and falconry.